First dates, work presentations, and other social situation can make you feel a little nervous. Having butterflies is a normal reaction which isn't the same feeling when you have a social anxiety. This type of disorder can make even the most normal social interactions terrifying. Individuals are plagued with fear, embarrassment and are incredibly self conscious because they fear being judged or criticized. This fear can affect many areas of your life as it often leads to avoidance that disrupt your social and work life. The reason behind social anxiety can be different for everyone. This article will cover some of the most common causes for individuals to have a social anxiety. Individuals who have parents or siblings that suffer from social anxiety are more likely to have this disorder. This may be from genetic or because of their upbringing. It is during the early years of childhood that children learn how to handle social situations from those around them. If a parent or siblings exhibit social anxiety behaviors, then the child will learn these behaviors. Additionally, abusive, controlling or neglectful environments can also promote social anxiety. These types of environments can make a child grow up feeling worthless or will contribute to them having low self-esteem, which will affect how they handle social situations. While there may not a gene that is linked to social anxiety, it is possible for this disorder to run in families. As mentioned above, children who have parents or siblings that have a social anxiety are more likely to develop this anxiety because of learned behavior. Serotonin can play a rule in those who have social anxiety. Serotonin is a brain chemical that can impact a person's sensitivity. When serotonin levels are not balanced, this can lead to individuals feeling overly anxious and stress in many situations. Certain areas of the brain can indicate if a person has a higher risk of developing social anxiety. When the amygdala region of the brain has increased activity and blood flow, it is more likely that a person will have social anxiety. This area is responsible for processing emotions and sends warnings out to the rest of the brain and body if it is in danger. So what causes social anxiety could be a result of an overactive amygdala. Also, having a smaller hippocampus in the brain indicates an increase in social anxiety. This area is responsible for storing memories. If it is traumatic or you have had threatening experiences, these will get stored here as memories. Individuals who suffer from social anxiety often have a smaller hippocampus region in the brain, which can either be a result of the social anxiety or was already smaller before developing the social anxiety. Where you live can also impact your risk of developing social anxiety. Typically, individuals who live in warmer climates are less likely to have social anxiety. Those living in colder climates tend to suffer more from social anxiety. This may be because those in warmer climates are more likely to interact with others more on a daily basis, while those in colder climates tend to stay in more. Individuals who have suffered through multiple negative experiences are more likely to have social anxiety. Children who have been bullied, teased, rejected, or ridiculed on a regular basis tend to suffer from social anxiety. Other negative experiences that can lead to social anxiety include sexual abuse or family conflicts. There are a number of symptoms you may experience that can indicate social anxiety. Feeling flushed, nauseous, shaky, dizzy or lightheaded, increase in heart rate as well as sweating or having difficulty speaking can be signs of social anxiety. These symptoms often occur in many types of social interactions. 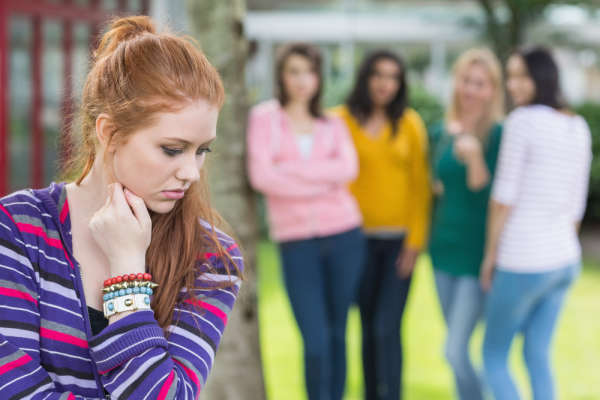 What causes social anxiety symptoms may not always be outward. increased worrying about social situations that can last for days or weeks. constant worry about embarrassing yourself when in social situations. becoming stressed, nervous and worried about being noticed in social situations. relying on alcohol to attend or deal with social interactions. avoiding work or school because of the anxiety you feel from being there. Having social anxiety may not cause you to show symptoms in every social setting. Many times the anxiety can arise in very specific settings like when having to eat in front of others or talking on the phone. Cognitive behavioral therapy - Through this type of therapy, you will learn how to take control over your anxiety. You learn relaxation techniques and breathing techniques that can keep you in a positive place when handling social situations. Exposure therapy - If knowing what causes social anxiety and leads you to avoid social situations, you may benefit from exposure therapy. This therapy allows you to slowly face the social situation that causes you to feel anxious as opposed to simply avoiding them. Group therapies - Group session allow you to interact with others. You meet others who have the same anxieties like you and you work as a group to slowly face and overcome your social fears. Avoid caffeine - Foods that contain caffeine can increase social anxiety. If you have social anxiety, you should avoid foods like coffee, sodas, and chocolates. Sleep - Not getting enough sleep can increase your social anxiety symptoms. At least 8 hours of sleep is recommended for all individuals, but is especially necessary for those with social anxiety. Medications - If there is no improvement in your social anxiety through therapy or lifestyle changes, you may need to consider medications. While these medications will not cure you of your social anxiety, they can help you function better in your daily life. Speak to your doctor if you think medication may be necessary to help with your social anxiety.